As we received a brief for our first unit , Anatomy yesterday, I thought I'd better give it a read through and see what I can look at before our lectures begin. The introduction to the brief mentions Rembrandt as an artist known for his self portraits, as well as his painting. I have read some on the artist and understand why I think he has been mentioned so early on in our course. Rembrandt is a 17th Century Dutch artist who is well-known for his portraits, etchings and paintings. After looking at some of his work I instantly recognised a few of his biblical paintings, which I have now learned are in the Italian style of 'Chiaroscuro', which means light-dark. 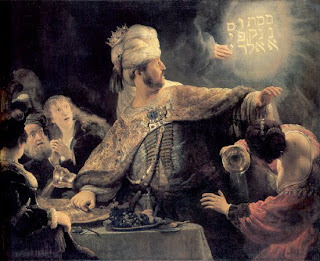 You can see this style in the painting below, which is biblical painting entitled 'The Feast of Belshazzar: The Writing on the Wall". "Rembrandt was one of the greatest draftsmen in the history of art. Because he usually regarded his drawings the way a novelist regards the ideas he jots down in his journal"
This is why I think he is associated with our unit. His skill to create rough drawingsand sketches which can then be refined and selected from later will be something that we will have to try and use over the next few years to plan and design our projects . 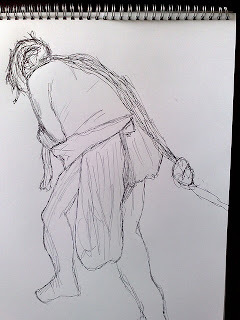 After looking at Rembrandt's rough pieces, I attempted to mimic some of his work to see how long each drawing would take, as well as seeing how little detail I could get away with, whilst making the drawing resemble a human. I would like to continue to use his style with rough drawing and hope I can build on it in the future. You can see more of this style of drawing by Rembrandt, as well as his etchings and paintings through the link below. I'm just looking at some blogs and your movie likes caught my eye.